The Captain Marvel reshoots kicked off recently and some new set photos have leaked. Brie Larson's Carol Danvers and Clark Gregg's Agent Phil Coulson are featured in the latest images from the set. Principal photography wrapped back at the end of June, and reshoots for Avengers 4 took place at the end of September and ended in October. With the release date fast approaching, now is the right time to finish up Captain Marvel and to tie up any loose ends before the post-production process can be completed. In the set images from Captain Marvel, Brie Larson is seen wearing the green Kree suit, that she was spotted in for most of the leaked behind-the-scenes shots from principal photography. The 29-year old actress is gearing up for her big screen debut as the mighty Carol Danvers and the story is mostly a mystery at this time. Clark Gregg can be seen sporting a full head of hair while dressed in a suit. Gregg already looks pretty young, but if you look closely, motion capture dots are revealed for the de-aging process in post-production. In addition to the de-aging of Agent Coulson, Captain Marvel also utilizes the same technology on Samuel L. Jackson's Nick Fury to bring both characters back to 1995, which is when the movie takes place. Fury and Coulson don't initially get along, according to Gregg, who notes that his character is wearing MC Hammer pants in the movie. However, Hammer's heyday was at the beginning of the 1990s, which means we could see a flashback even further to the beginning of the decade. Or Gregg could be pulling our legs. As seen in the first Captain Marvel trailer, Carol Danvers is introduced as the most powerful character in the Marvel Cinematic Universe to be shown thus far. 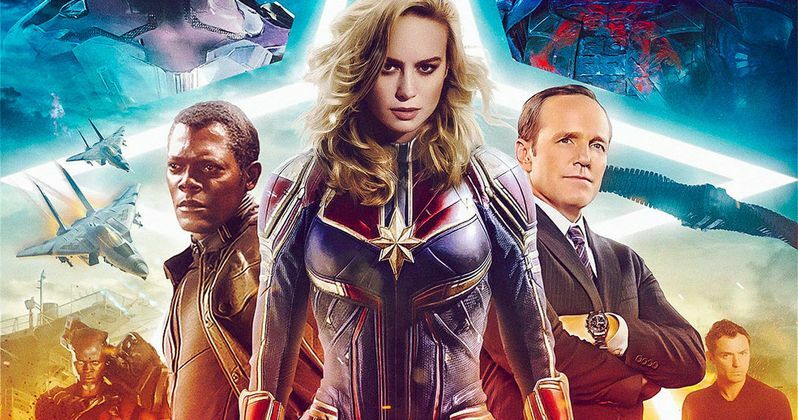 Marvel Studios boss Kevin Feige has been hyping the immense power of Danvers for months, getting fans prepared for what they are about to experience. Additionally, Feige has noted that Brie Larson's Danvers will be taking on a Tony Stark-like role in the upcoming Phase 4 of the MCU, which sounds pretty interesting. With all of this hype surrounding Captain Marvel, many are beginning to wonder how her presence will factor into Avengers 4. It has also been questioned as to why Nick Fury waited so long to contact Carol Danvers within the MCU. As explained in the new Captain Marvel Prelude comic, Fury knew it was something he pulled out in only the most dire situation, which is why Danvers is contacted at the end of Infinity War. Now, fans are going to see a brand-new type of origin story when Captain Marvel hits theaters early next year, while also setting up her arrival in Avengers 4. How will Danvers fit in with the rest of the team when it comes to taking on Thanos for a second time? While we wait to find out, you can check out some images from the Captain Marvel reshoots below, thanks to Just Jared.